I was officially chosen and invited by the committee of the 10th Tango World Summit to be the artist representing the Tango in London. I will be performing in Zarate at the opening show of the Summit on February 26th, 2015. The Tango world summit is declared by the ministry of culture of Argentina as of Cultural interest and it is the world largest gathering including all aspects of Tango (music, poetry, dance and more..). The most respectful artists in the Tango world will be presenting their art in the summit and I am thrilled to share the stage and the event with them. It is a big honor to be there representing the city of London and I will make sure I do my best and put London in an important position in the World Tango Map. During the World Summit of Tango concerts will be held in different theaters and cultural spaces in the city, established artists recitals, milongas, exhibitions, workshops and conferences about tango music genre, urban and contemporary. 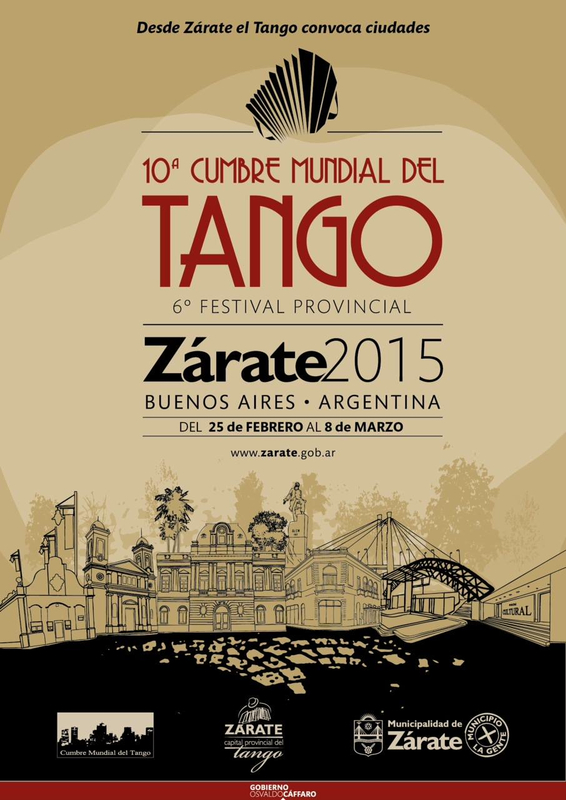 The Tango World Summit is a major cultural space of Tango in which all manifestations tend to relate the hosting city and the invited towns affirming Tango as an urban culture. Will lead the presentation members of the Standing Committee of the World Tango Summit and Mayor Osvaldo Zarate Cáffaro. In turn, the Minister of State for Culture, Teresa Parodi, Minister of Culture of the City of Buenos Aires Hernán Lombardi, and Chairman of the Cultural Institute of the Province of Buenos Aires, Jorge Telerman, were invited to participate in this major global launch in Zárate that will unite the greatest artists of the genre. The summit counts with the presence of Susana Rinaldi, Raul Lavie, Patricia Barone, Guillermo Fernández, among others. Previously, the World Tango Summit was held in Buenos Aires (1992); Granada (1994); Montevideo (1996); Lisbon (1998); Rosario (2000); Sevilla (2005); Valparaiso (2007); Bariloche (2009); Seinäjoski (2011). Previous editions of the Summit were attended by Horacio Ferrer, Susana Rinaldi, Rubén Juárez, Raul Lavie, Juan Carlos Copes, Osvaldo Berlingieri, Tirao, Miguel Angel Zotto, Juan Carlos Cuacci, Amelita Baltar, Leo Sujatovich, Osvaldo Montes, Juan Esteban Cuacci , Argentina Empire, Enrique Morente and Martyrdom, among others. One feature of the invitation to join the Summit for different artists and their cities is to explain with examples how the Tango, a genre born in Buenos Aires and other cities of Rio de la Plata, has become an urban genre that expresses, perhaps like no other, the average citizen of our time and the evolution of urban anthropology. Here’s how in previous summits artists from so distant and different cities participated, like Berlin, Helsinki, Malmö, Lisbon, Rosario, Amsterdam, Córdoba, Santiago de Chile, London, Rotterdam, Buenos Aires, Arica, Bello Horizonte, Barcelona, Stuttgart, Bariloche, Seinäjoski , Arhus, Viña del Mar, Tokyo, Valparaiso, Granada, Lima, Montevideo, Sevilla, La Paz, Geneva, Cádiz, San Pablo, Tenerife, Junín, St. Petersburg, Mar del Plata, San Martin de los Andes, Warsaw, Valencia, San Sebastián, Málaga and Kyoto, among others.